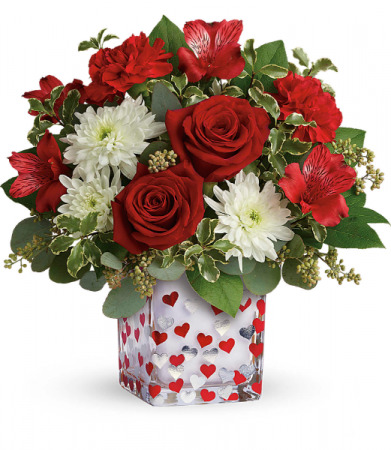 Each Roses, Cm, Red, Alstroemeria, Red, Each Carnations, Red, Chrysanthemums, Cushion Spray, White, Pitta Negra, Seeded Eucalyptus, Lemon Leaf, Block Floral Foam, Happy Harmony Cube, Teleflora, V, ( H X W). 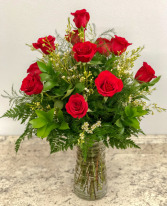 Each Roses, Cm, Red, Lilies, Oriental, White, Each Stock, White, Each Aspidistra Leaves, Variegated, Pittosporum, Variegated, Lemon Leaf, Wrapped With Passion Vase, Teleflora, V, ( H X W Opening). 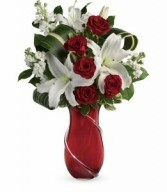 Romantic red roses and pure white lilies are the ultimate show of love and tenderness this Valentine's Day. 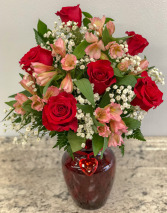 Artfully arranged in a showstopping art glass vase with hand-applied glass ribbon, this luxurious gift will warm her heart for years to come.